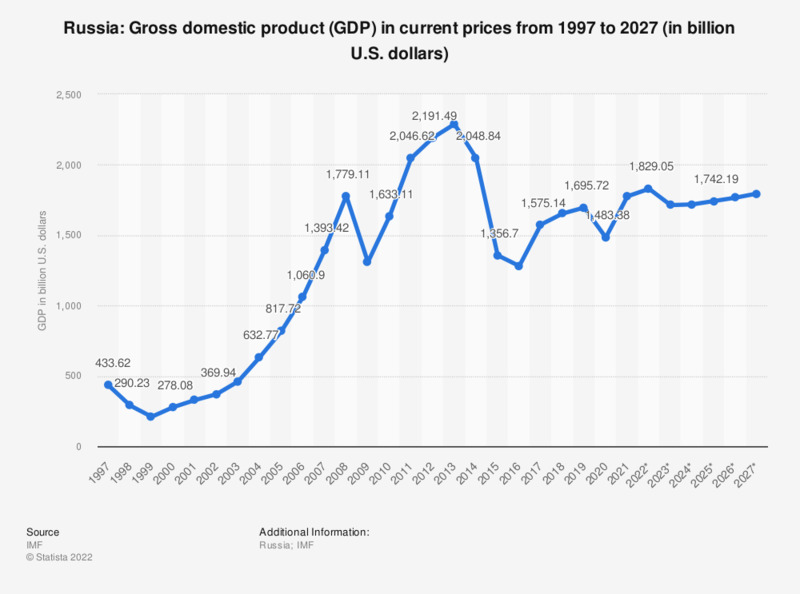 This statistic shows the gross domestic product (GDP) in Russia from 2012 to 2017, with projections up until 2022. GDP refers to the total market value of all goods and services that are produced within a country per year. It is an important indicator of the economic strength of a country. In 2017, the GDP in Russia was around 1.58 trillion U.S. dollars. The Russian economy is primarily directed by both the private sector and the state. As a member of the BRIC, Russia is currently experiencing an accelerated growth within the economy with a chance of earning a place in the G7 economies. As of the 1990s, a large amount of the country’s industrial and agricultural sectors were privatized, however energy and military production remained with the state for the most part. As a result, the majority of Russian exports consisted of energy products as well as high-tech military equipment. The effects of the global financial crisis of 2008 took a similar toll on the Russian economy, however only had short term effects. Russia recovered after 2 years and has since experienced exponential economical growth and productivity due to aggressive and prompt actions from the government, providing Russia with one of the most profitable economies in the world. Additionally, unemployment reached an all-decade low from the recent Russian economic boom, which furthermore implies that there is a slight growth in wages, however is also accompanied by a large worker shortage.